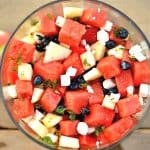 Watermelon, Blueberries, Apples, Feta, and a fresh lemon mint dressing combine to make this a refreshing summer salad that is perfect for a Patriotic Celebration! A little personal note: I have America on my mind. In just a few short weeks we’ll be celebrating America’s birthday in America for the first time in 5 years. I. Cannot. Wait. So excited for parade time, the pool, a neighborhood BBQ with friends, and fabulous food. I’ve been trying some new recipes for the upcoming celebration, and this one is definitely one I want to share with you! 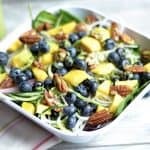 Summer time and gatherings are a perfect occasion for light salads that the whole family will enjoy. If your kids are anything like mine, they can eat their weight in watermelon. They were thrilled when this was part of dinner the other night! I’ve combined watermelon, apples, and blueberries here for the red/white/blue color scheme. I’ve added in feta to give the salad a bit of salt to contrast the sweet lemon and mint dressing. 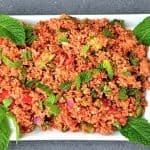 It’s perfect and sure to be a crowd pleaser! This can also be made earlier in the day. I would recommend keeping the feta and fresh mint off the salad until it’s getting closer to serving time (within a few hours). 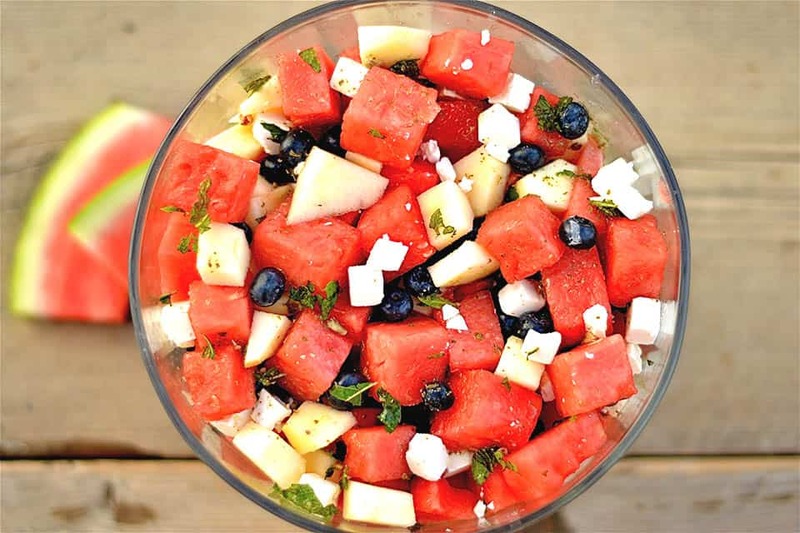 Begin by preparing the fruit: : Chop up the watermelon into 1-inch cubes and place into a large bowl or trifle. 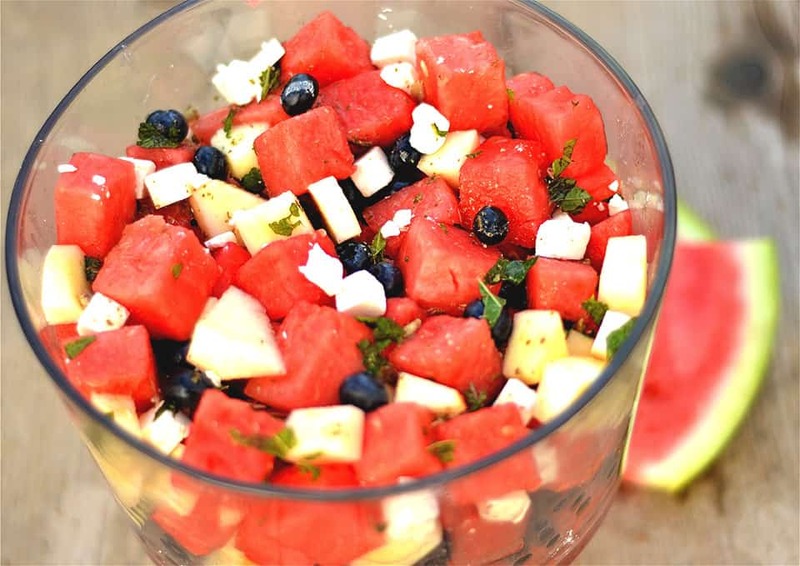 Rinse and dry the blueberries and add to the watermelon. Peel and core your apple, chop into small cubes or pieces (about 1/2 inch). Add feta and chopped fresh mint. Make the dressing: Whisk together honey, lemon, and vinegar. Pour over top of the salad, and toss together to make sure the fruit is evenly coated. Salad can be made up to 8 hours ahead. Feta and mint should be added later (less than 2 hours before serving). Wahoo! 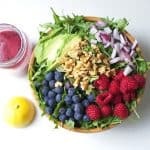 Love this patriotic salad! I wish I could be there too. I think I should plan a nice 4th July in US. In The Netherlands we celebrate the Kings birthday, which is also a mad event. Most people just wonder around getting drunk. However with my friends we usually organize a lunch. The theme is always the same . ORANGE. You know, I celebrated King’s Day in the Netherlands this year! It was so much fun. My family and I were visiting the town of Maartsen and had a great time watching the parade and festivities. The Dutch are my favorite! Making this for my contribution at my first CRAWFISH BOIL this Independence Day! I KNOW it’s going to be beautiful and delish! Woohoo!! Happy 4th of July!